While Bethesda has an innumerable amount of restaurants that are within walking distance from one another, there are very few that offer fine dining and, more importantly, successfully execute it. The recently-opened Newton’s Table accomplishes both. When Newton’s Table opened back in April, we were very excited about the notion that Dennis Friedman, the chef and co-owner of the renowned Bezu in Potomac, would be opening his very own restaurant in downtown Bethesda. Occupying the former Rock Creek space, Newton’s Table is perhaps one of the more expensive restaurants in the DC suburb, but for good reason: their high-quality ingredients make for an excellent meal. 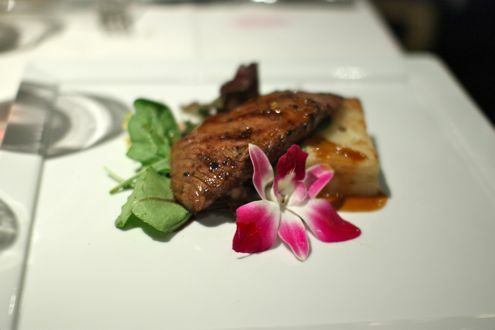 Because of their pricey menu, we initially postponed a trip to Newton’s Table unless it was for a special occasion. 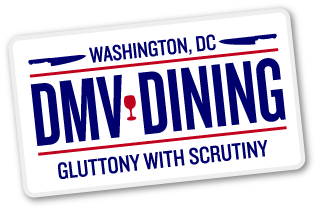 Then Bethesda Restaurant Week came along, and wouldn’t you know it, Friedman’s venue was participating! Rachel worked her OpenTable magic within minutes of hearing the news. With our cousins Scott and Barbara, we arrived a few minutes early and got a drink at the bar. While their wine list is nothing to scoff at, their beer selection is rather limited. Hopefully it’s something they can improve in the near future, especially given all the relatively local breweries in the area. While our reservation was for 8pm, we weren’t seated until 8:30 due to a table taking an excessive amount of time chatting it up. Not that it was a big deal for us, but the hostess was very apologetic for the inconvenience. Once we got to our table, we looked over their Restaurant Week menu. While it was only limited to three entrees, the least expensive dish would have cost $26 a la carte, so this was a very good deal considering we were paying $30 for three courses. For our first course, both Rachel and I ordered the salt and pepper shrimp. 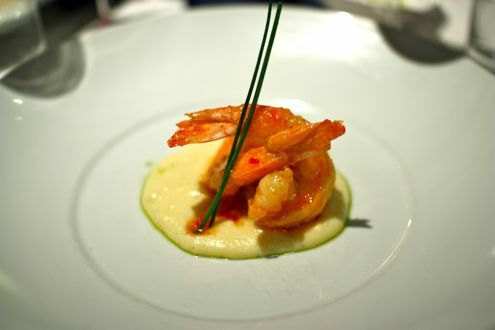 The jumbo shrimp was atop a bed of creamy polenta that was drizzled with chili sauce. The combination made for a great first course. In fact, I might have enjoyed the polenta more than the shrimp itself. The presentation was also a very nice touch and something you typically don’t see in Bethesda restaurants outside of a few places (which is sort of depressing when you think about it). For our entrees, I went with the Fuzu Noodles, a dish Friedman made famous when he was the chef at Bezu. 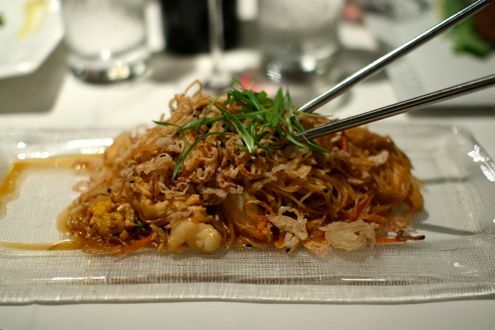 A modern twist on pad Thai, it featured a mixture of rice noodles, snow peas, carrots, onions, bean sprouts, eggs, chicken, shrimp, scallops, sweet and spicy soy sauce, black sesame seeds, crispy shallots, and scallions. Phew! Anyway, I really enjoyed it. Between the silver chopsticks protruding from the heap of noodles as well as the generous portion size, I could see why this was such a hit at Bezu. I especially liked the crispy shallots that were sprinkled atop as it gave the dish a subtle, crunchy texture. 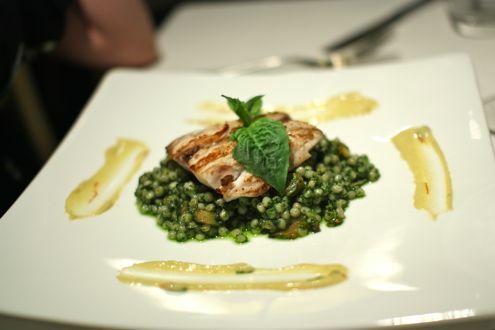 The rockfish was prepared grilled and complemented with Israeli couscous, basil pesto, summer squash, and a saffron aioli. The rockfish was simply prepared, but perhaps it needed to be in order to balance with the flavors of the couscous. Rachel couldn’t get over how good it was, especially combined with the pesto flavor. Usually I think of pesto as fairly heavy when accompanied with pasta, but with this, it was very light and perfect for summer. 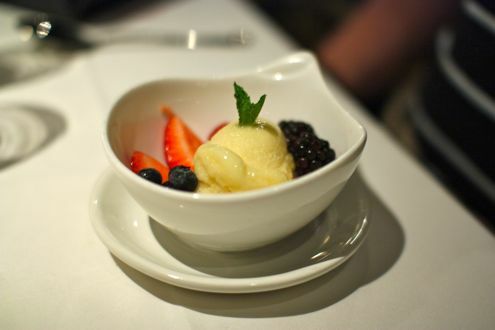 For dessert, there were only two choices for Restaurant Week: lemon sorbet with fresh fruit, and vanilla bean honey cheesecake. Rachel ordered the former while I went with the latter. We both agreed that while the sorbet tasted good when blended with the fresh fruit, it was overly tart by itself. 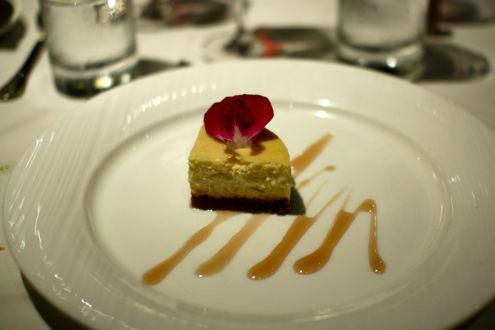 Meanwhile, the cheesecake was absolutely phenomenal. I’m not even a big fan of cheesecake, but this was some of the best I have ever come across. I hate to make blanket statements like that, but seriously, it’s that good. The vanilla and honey blended together in perfect harmony while the cheesecake itself wasn’t overly heavy, making for a nice summer dessert given the extraordinary heat we’re currently having. All and all, Newton’s Table has a very promising future. Outside of waiting for our table earlier in the night, the service was fine as our waiter was friendly and attentive. 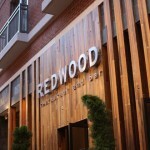 It’s a welcome addition to Bethesda and will hopefully cause a ripple effect for other restaurants to step up their game. One thing is for certain: Chef Friedman is swiftly making his mark in this town.